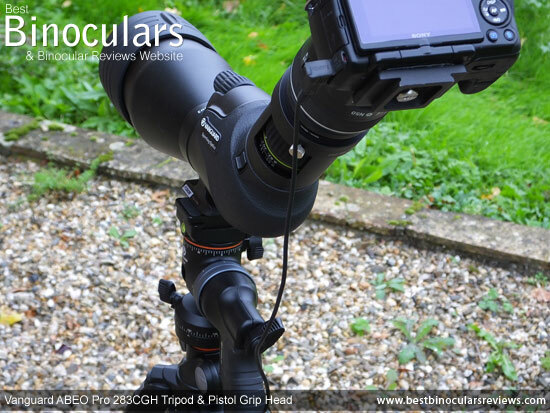 Apart from photography and taking videos for this site, I use my tripod for bird and wildlife photography, both with a standard camera & telephoto lens as well as digiscoping using a large spotting scope. 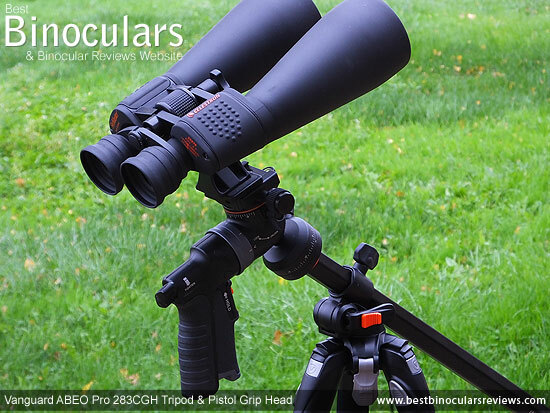 I also use it for general terrestrial observation, attaching my binoculars or spotting scope to it and for astronomy using higher powered binoculars, trained at the heavens. So as you can see my tripod needs to be very versatile as it has to accept a wide variety of equipment that is sometimes quite heavy and unbalanced. It should also be compact and light enough for me to carry about on location and take with me on my many travels, expeditions and wildlife safaris. I have been using my Vanguard Alta Pro 263AT tripod and GH-100 Pistol grip for a while now and whilst I love them both, especially as a combination, I have decided to upgrade to a lighter more travel friendly set-up, but I do not want to sacrifice at all on load carrying capacity, stability or versatility. 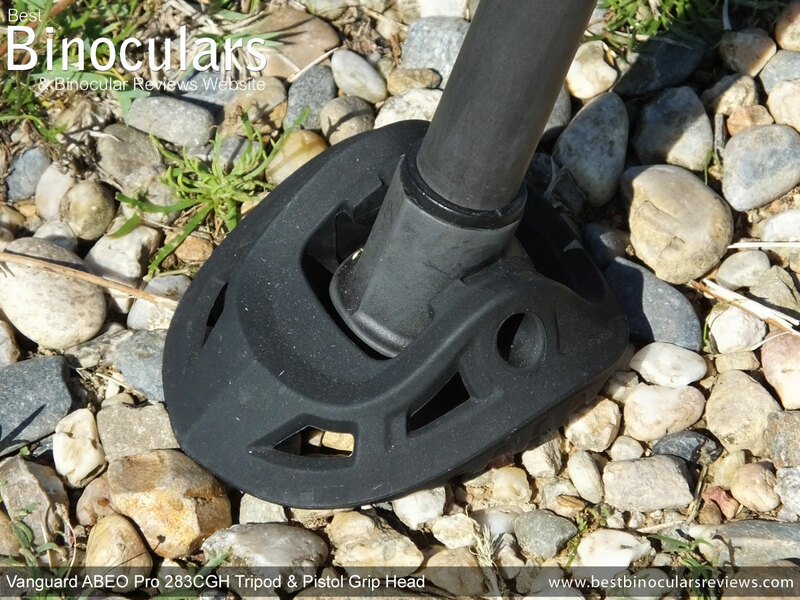 Fully extended, with the central column raised, the tripod reaches a height of over 1.5 meters, but by collapsing the three leg sections and retracting the central column, the Abeo Pro 283CT folds down to a height of just 60cm (excluding the tripod head). For a full sized tripod this is pretty good and means I can easily pack it away in with my luggage or attach it to the back of my camera backpack. It also improves on my last tripod the Alta Pro by a few centimeters. 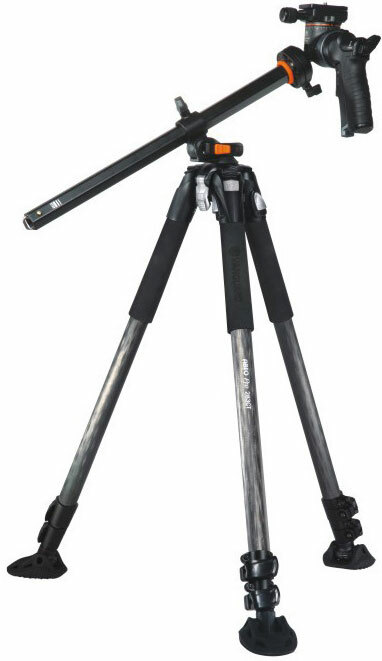 Whilst this folded length may not compete with a specifically designed travel tripod like the Benro Travel Angel 2 that I reviewed for The Safari Guide, you do get a taller tripod when extended and it is far more stable, especially when loaded with heavier gear. Weighing in at 2.05kg (4.51lb), it must be said that for a carbon tripod, the Abeo Pro 283CT is not the lightest one out there. However this is down to the inclusion of features like the "Multi-Angle" column (see below), which whilst it adds a few grams here and there, it also vastly improve the versatility of the tripod. For me it is a trade off I am willing to make and just means that I will have to remove a little more clothing from my bag to keep it under the baggage allowance! 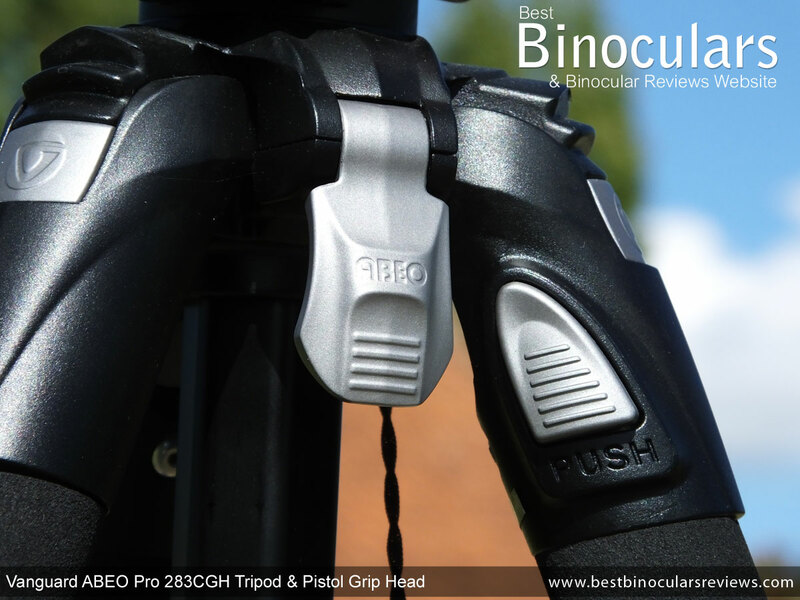 Whilst most tripods allow you to adjust the height of the central column, on the ABEO Pro you can also change the angle of the column, giving you a whole lot more flexibility. This is great for macro photography, or when makes it easier to balance your setup when you are positioned on very unlevel ground, or I have found it particularly useful for astronomy or aircraft spotting as it enables you to sit in a very comfortable position under the tripod and look up into the sky, which with a standard tripod is a little more difficult/awkward. To adjust the angle of the central column, you simply loosen the column knob and raise it right to the top, then unlock the swivel lock latch and you have a full 180° of movement and once you are at your desired position, just flip the latch again to lock it into position. What is more is the central column can also swivel, which can be used as another way to pan from side to side without having to adjust anything on your tripod head when the column is in the vertical position. However when you have the column set at an angle it also enables you to swing your camera/scope/binoculars around the base of the tripod and it acts like a boom arm, which in certain situations can be very useful. To release the column, you simply flick up the large silver lever near the head and push it back to lock it in place. Each of the legs is divided into three sections with tho levers on each leg, which enables you to adjust them to the height you require. The levers are large and prominent enough so as to make them easy to open and close even with thick gloves on. You can also open and close both at the same time to speed up set-up and take down times. The three leg sections give you a plenty of scope when you need to adjust the height, but they also lock at three different angles: 25°, 50° or 80°. This can be a good way to adjust the height, but is also important if you need extra stability with a wider base. By adjusting the angle of the central column to almost horizontal and opening the legs out to 80° you can get very close to ground level which is ideal for getting a unique angle on a subject or for some macro shooting. To adjust the leg angle, you simply press a the large silver button located at the top of each leg, which releases it from that setting and then open the leg until it clicks into the next setting. Most good tripods allow you to change the feet from a rubber base to a spike, depending on what terrain you are setting up on. Not only does the ABEO Pro 283CT have these two options, but you also have some wide base shoes that give you even more support on flat surfaces and a bigger footprint which helps on terrain like sand or snow. At first I thought they looked a little ungainly, rather like a child who has put shoes on that are too big for them! But for the most part, they really do not get in the way when moving the tripod about and they automatically flick out and lay flat when you place them on the floor and I do feel that they provide you with a little more stability on some surfaces. If however they do annoy you, or you do not need them, then they can easily be removed and stored away. For me and my wide variety of uses, a pistol grip tripod head is by far the best solution. I love the way once you have set it up to support the weight of your equipment, all that it takes is for you to pull of the trigger and then aim at a new subject. 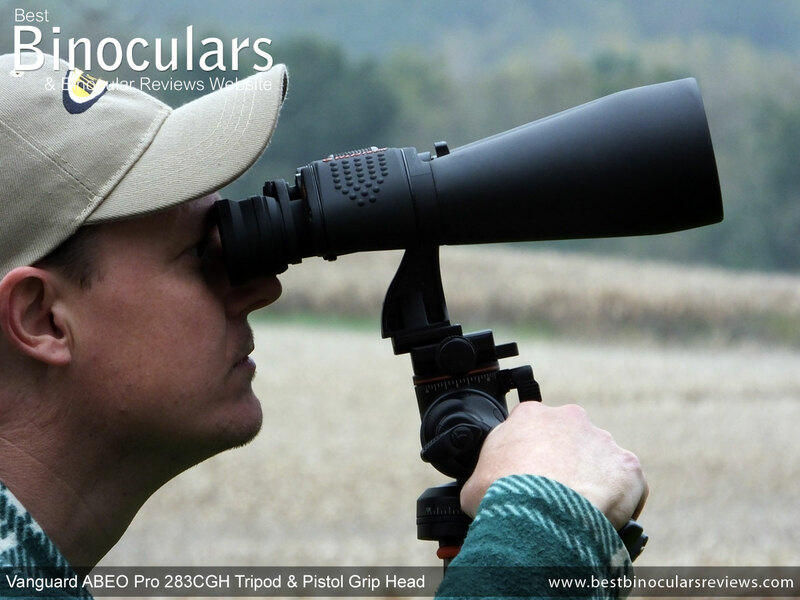 This makes aiming at your subject so much faster and more intuitive, no matter if you are using your camera, binoculars or spotting scope. This works especially well when you have a large telephoto lens, but even more so when looking through a spotting scope or binoculars, as you can easily and quickly adjust the head to change direction without having to take your eye away from the eyepiece. Compare this to a traditional ball head where you have to loosen the ball, fiddle with your gear to get it in the right direction and then tighten it again, all the time making sure that your heavy gear does not fall over with the ball loosened. Then there are the pan and tilt tripod heads that you have two levers to loosen and turn and then twist again to tighten. By that time I often find that the bird or whatever else I am trying to aim at has long since moved on. For a few years now I have been using the Vanguard GH-100, which after reviewing and testing it, I liked it so much that I decided to purchase it. Since then, Vanguard has introduced their upgraded and beefier GH-200 and now their latest pistol grip is this GH-300T that comes with the ABEO Pro 283CGH Kit. The actual grip and main trigger on the GH-300T grip is covered in a hard rubber, which helps with grip and feels very comfortable. 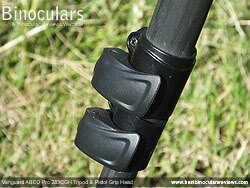 Pulling in this main trigger releases the ball head and you can then freely aim your camera, scope or binoculars. This simple release mechanism is very quick and because the it is so natural and intuitive, the whole process of aiming is far quicker than on any other type of tripod head that I have used. Because the grip is basically built around a ball head, you get a huge amount of movement (-32 to +90° of side-to-side tilt & -8 to +90° back to front tilt movement). Initially the 8° of upwards tilt may seem inadequate for uses like astronomy or birding when you need to point your binoculars, spotting scope or camera towards the sky, but these are a couple of ways of increasing this. Firstly you can angle the central column so that the whole head points upwards and/or you can also rotate/pan the grip so that the notches in the ball grip change relative to the handle, in this way you can get a full 90° of upwards tilt and look directly above you. At the rear of the pistol grip there is a lever that allows you to loosen or tighten the amount of friction that is applied to the ball head when you have released the trigger. So for heavier equipment you would tend to tighten this to make sure that the head holds your gear securely when you are not holding the pistol. At the top of the grip handle where it meets the ball head is a silver ring. If you pull this back, you can rotate just the pistol handle a full 360°, which helps you customise it to suit your needs or a particular shot. 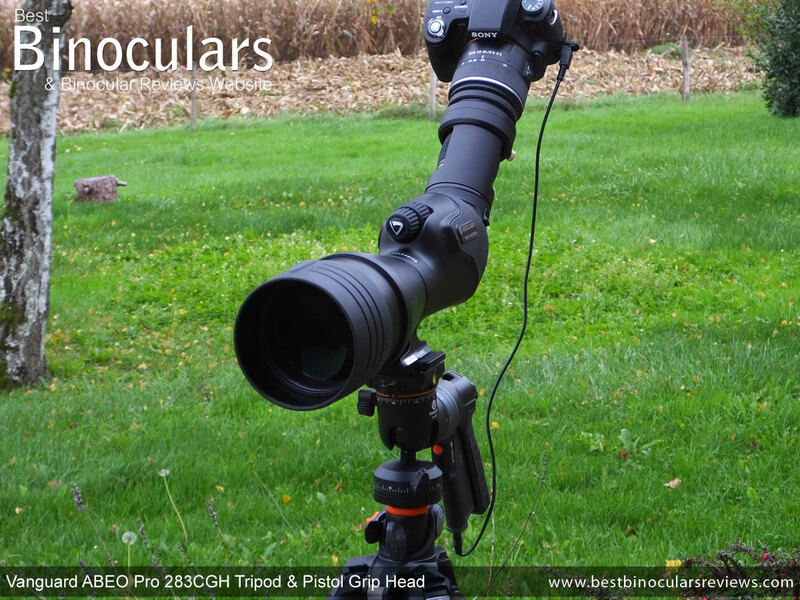 I have found this feature useful in some situations where the handle gets in the way or to make it more comfortable to use, especially when using smaller binoculars on the tripod. All I do then is rotate the handle to 90° and then swivel it to the side of the binoculars, which then allows you to look through and aim the bins, without the grip getting in the way (see image above). In most ways, the GH-300T looks and indeed works a lot like the other Vanguard pistol grips, but with one major difference. It now includes a mini shutter release trigger located on the front face of the pistol handle. 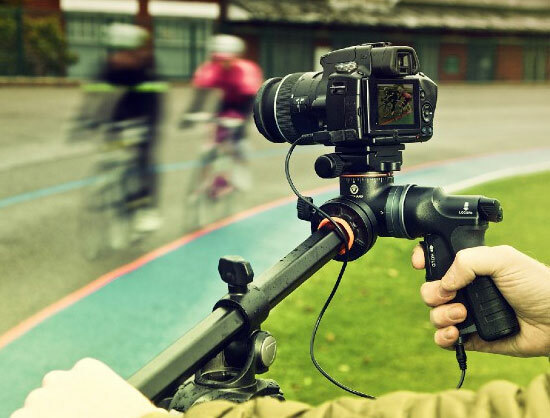 With the right cable that connects from the base of the handle to your camera, it enables you to take photos by pressing the small orange button without having to change your grip from pistol to the camera. Obviously for binoculars and scopes (unless you are digiscoping) this does not apply and you can just use the pistol grip without the cable attached. Vanguard have a number of different connections that will connect to most SLR type cameras, so just make sure you have the right one for your camera when you order it. I have been using a remote shutter release for a while now with all my digiscoping as it dramatically improves your photos by eliminating the camera movement made when pressing the shutter release, so I found that using the trigger no the grip was straightforward and it and worked well with my Sony Alpha DSLR. The cable supplied is fairly short, which when you are just using your camera is perfect as it does not get in the way. However when digiscoping, I found that with my angled scope and the camera being at a further distance away, it was quite tight and I was actually quite lucky that it fitted. I would also say that in terms of camera shake, the trigger is a massive improvement when compared to pressing the shutter release on the camera when digiscoping as even the slightest movement at very high magnifications can ruin your photo. But you still need to be careful not to press the trigger to hard which can make a little movement and for that reason I would say that it is not as good as a totally separate cable remote release that is not connected to the tripod at all. The jack for the cable connects right under the pistol grip, which I have to say is not the best position as it is a little exposed and I have heard of cases of people bending or breaking it, so you just need to be aware of this and be a little careful. 1) As I have already discussed and somewhat uniquely, one way to pan is with the central column as it can swivel. 2) Located on the right just under the mounting plate, you will find a small lever. Loosen it and this enables the top plate to rotate 360°, there are also markings in degrees for more accurate movements or just to keep track. This panning mechanism is very finely ratcheted with fine steps and so whilst this is not ideal for filming, for photography it makes your movements very precise. 3) The next panning mechanism is located just under the ball head. This also has a small lever and is marked and can rotate a full 360°. The main difference to the top one is that it is smooth and is thus perfect for recording video or if you need to pan very quickly, when chasing after a bird for example. According to the company, both the Vanguard GH-300T pistol grip and the Abeo Pro 283CT Tripod have a max load capacity of 8kgs (17.6lbs), which should be more than enough for most users needs, but how stable is this setup when it is fully loaded? 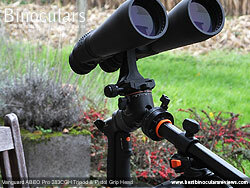 My heaviest and most cumbersome combination was when I was digiscoping using my Sony Alpha DSLR camera and the Vanguard Endeavour HD 82A spotting scope and not only did this tripod and head easily take the unbalanced load, but the pistol grip made it much easier and quicker to aim the scope than the traditional ball head or pan and tilt heads that I have used in the past. Not only is the large 82mm scope relatively big and heavy, but because the camera and the adapter a quite far from the pivot (balancing point), the set-up pictured above "wants" to tip over backwards. But by tightening the ball grip's tension lever at the rear of the pistol, it can easily hold the weight and because you are holding the pistol when aiming, you don't have the problem of it tipping over when you loosen the grip to aim as you would with normal ball or pan heads. Camera shake, even at these very high zoom levels was minimal, which with the use of the remote trigger, was reduced even further when compared to pressing the shutter release on the camera. 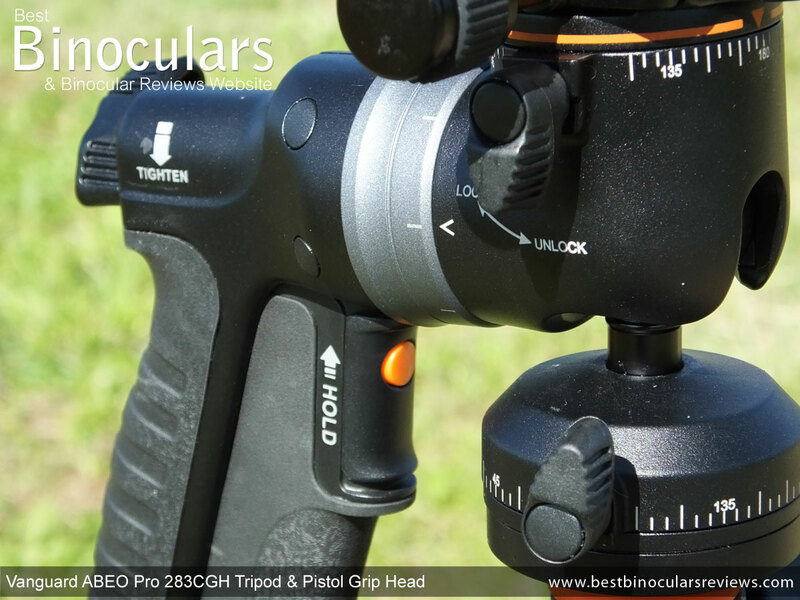 I started this review by stating that I was looking for a reasonably lightweight, compact yet versatile tripod that could handle even the heaviest of my gear and I have to say that the Vanguard ABEO Pro 283CGH is all this and more. 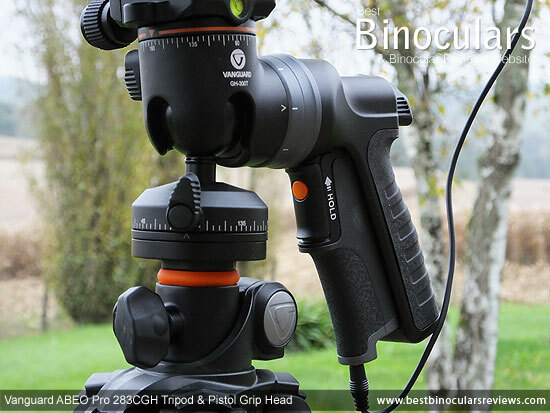 Whilst compared to a simple tripod, you will need a little time to get used to the vast amount of possible adjustments you can make, the multi-angle central column and adjustable legs on the ABEO Pro 283CT tripod combined with the very adjustable GH-300T ball head pistol grip means that there really is not a position that you cannot get into to get the perfect view or shot. This adjustable column and the pistol grip may mean that as a pure travel tripod, it may be a little heavy and bulky for some, but as a full sized stand, I had no problem slinging it over my shoulder, r attaching it to my camera backpack and carrying it about with me out in the field. It is very well made, using great quality materials and you can see that a lot of thought has gone into the design, which all add up to what must surely be one of the very best tripod, pistol grip combinations currently on the market. The opinions and views expressed on this page are my genuine and honest thoughts on the Vanguard ABEO Pro 283CGH Tripod kit and as with all my other reviews, I came to these conclusions after fully testing the product over a long period of time. The review is also not biased in anyway and I have not been asked nor would I agree to write a review in a particular way.